Tzafriri AR, Keating JH, Markham PM, Spognardi AM, L Stanley JR, Wong G, Zani BG, Highsmith D, O’Fallon P, Fuimaono K, Mahfoud F, Edelman ER. Arterial microanatomy determines the success of energy-based renal denervation in controlling hypertension. Summary: Renal denervation (RDN) is a treatment option for patients with hypertension resistant to conventional therapy. Clinical trials have demonstrated variable benefit. To understand the determinants of successful clinical response to this treatment, we integrated porcine and computational models of intravascular radiofrequency RDN. 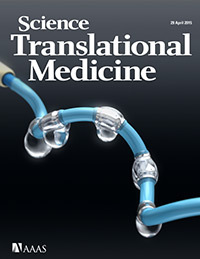 Sci Transl Med. 2015 Apr 29;7(285):285ra65. doi: 10.1126/scitranslmed.aaa3236. Also featured on the cover of this issue. Full article available for download here.